Hope you had a relaxed and fun-filled Christmas + New Years!! This year we decided to stay in Europe for Christmas and celebrated in beautiful Austria! 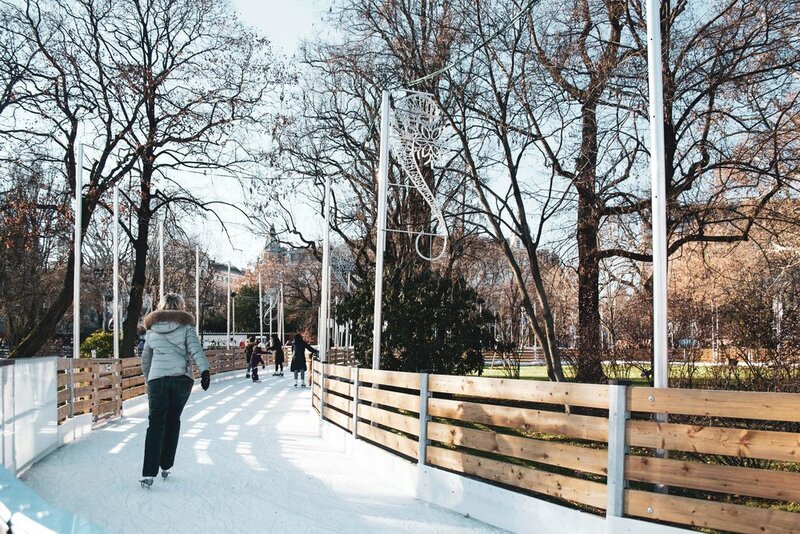 We went to Vienna, Salzburg and then rang in the New Year by checking off one of our bucket-lists which was skiing in the Austrian Alps with a group of friends! The entire trip was filled with loads of carbs (I just can’t say no to potatoes), schnitzles, many cups of coffee, quite a few cocktails and some questionable Austrian/German schnapps during après ski (HA!). I’m not gonna lie - it has been challenging to get back in the groove since we have been back from our trip (I blame all those potatoes). But, nonetheless, I finally finished editing the many photos and am excited to share a few things we learned from traveling during Christmas in Europe as well as what you can do when visiting Vienna anytime of the year! During the holidays, when stores + most restaurants are closed, I would recommend using these days to visit the many beautiful museums, churches and opera houses. The Christkindlmarkt at Rathausplatz is the main market that will be open until the 26th, some of the smaller markets will start to break down after the 24th, but you can still find quite a few around the city to enjoy glühwein and Austrian fruit bread. Go to a classical concert, opera or ballet as a Christmas celebration. On the 25th, we went to see the Four Seasons by Vivaldi at St. Charles Church. It was a beautiful church inside and the strings played AMAZINGLY! TIP: I would highly suggest paying the extra money to sit as close to the front as possible. The seating is all on one level, and we were in the back of the church making it very hard to see the performers; and even though you are mainly listening, it makes the concert much more enjoyable to actually see these musicians play the strings (its pretty impressive!). 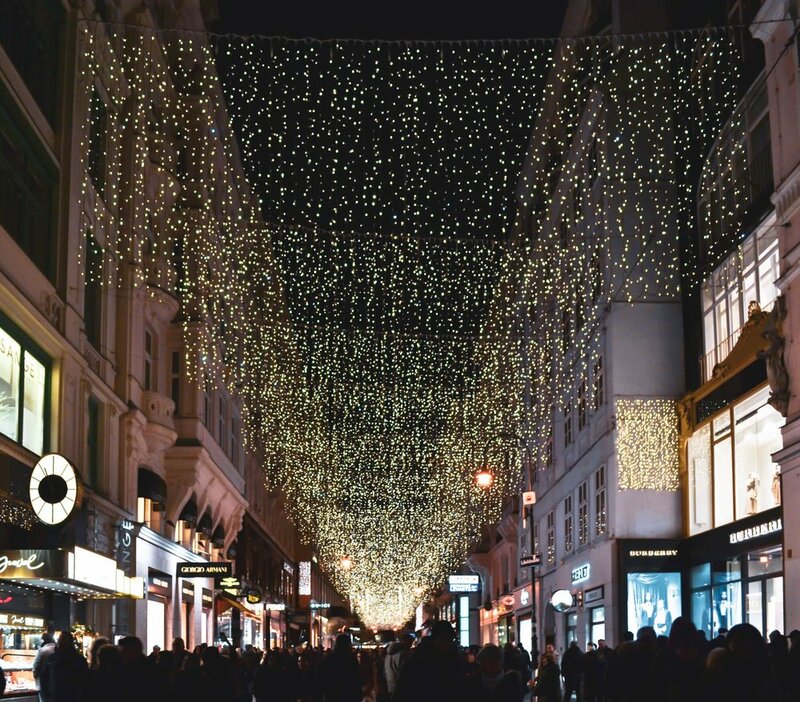 The city already has a romantic charm to it, but with the Christmas lights added everywhere, expect to experience a very magical Christmas atmosphere! Make dinner reservations weeks in advance! We didn’t make reservations (not smart of us - when will we learn!? ), so it was pretty challenging to not only find restaurants open during the 24th-26th, but ones that had availability too. Take a tour of Wiener Staatsoper, the leading Opera house in the world, or buy tickets to see an opera or ballet there. Eat a slice of the world famous chocolate cake, Sachertorte. Created over 200 years ago by 16 year old Franz Sacher in 1832 for Prince Metternich, the Sachertorte is one of the most well known Viennese culinary specialities. Vienna was entertained by Mozart and Beethoven, two very famous classical geniuses the world has ever experienced, still to this day. You can visit Mozart’s apartment where he wrote his world famous opera ““Le Nozze di Figaro” as well as visit Bethoveen’s grave site. He rests in The Zentralfriedhof Cemetery where you can find a duplicated version of the original gravestone. It’s kinda cool to roam the streets where these famed composers walked! 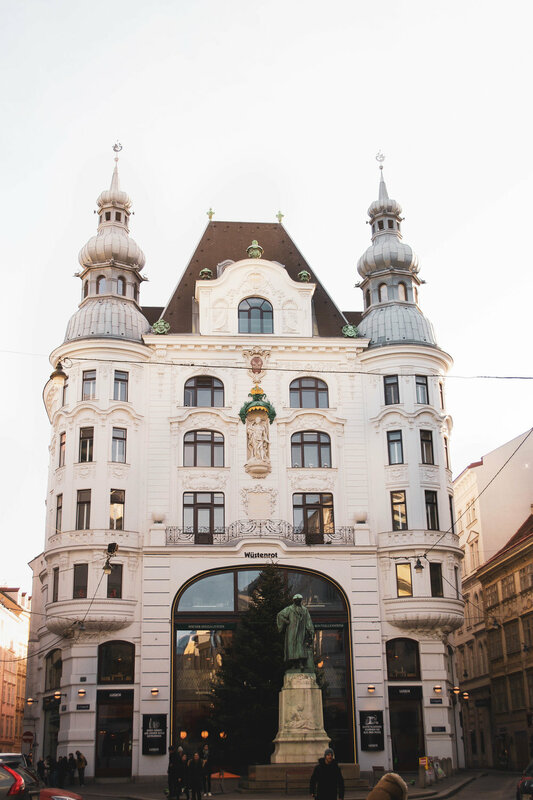 Spend hours touring museums, art galleries and palaces around Vienna. From the Belvedere Palace where you can admire famous works of Monet and Gustav Klimt, to touring the historic Schönbrunn Palace and gardens. Architecturally speaking, to me, Vienna felt like a mix of France and Spain as there were times I felt like I was in Mallorca or Paris when walking around. If you don’t do anything but walk the city (which is what we basically did) the buildings are enough to keep you entertained as they are incredibly grande, detailed and awe-inspiring. If visiting during the holidays, you can attend a Christmas mass at some of the churches. 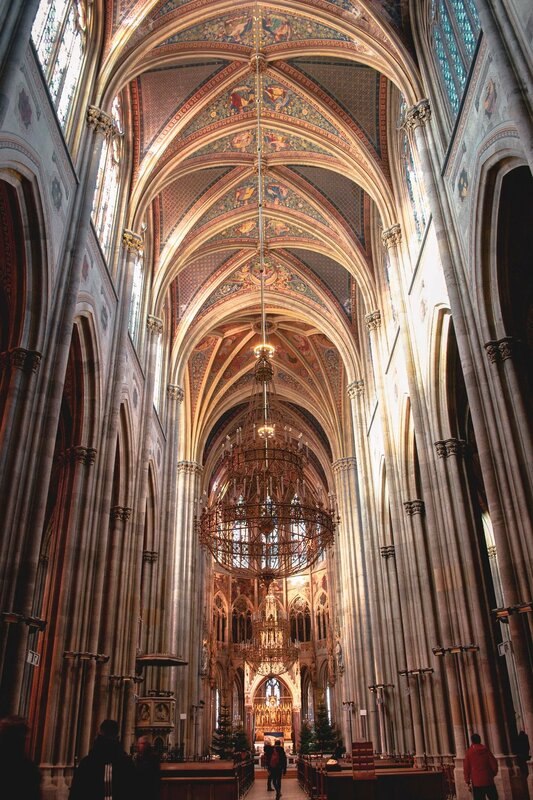 When we walked into St. Stephan’s Cathedral (1st image) they were actually having mass and we stood there listening to the choir sing which was such a peaceful experience. When we went inside Votive Church (the two images above) the sun was shining bright that day which had the stained glass windows illuminate all sorts of pretty colors inside. 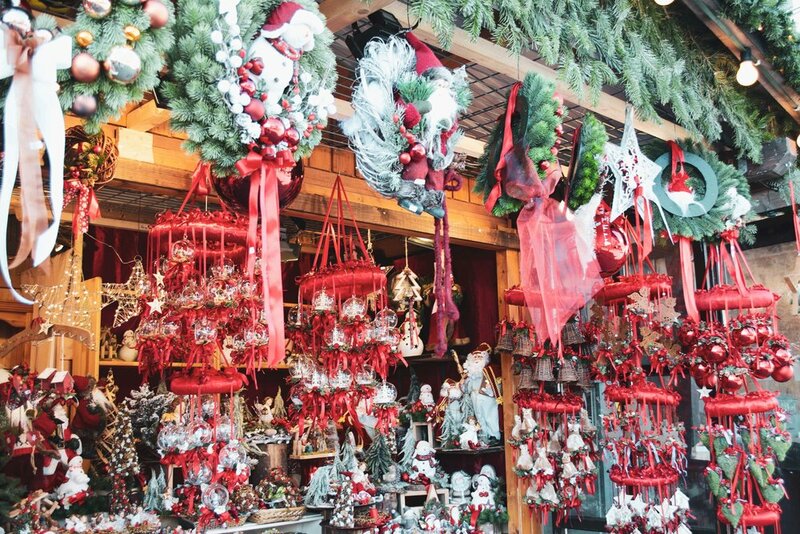 The Christmas Market at the Rhathaus is a must see! Although crowded, it is worth walking through to see all the different “shops” and array of traditional sweets and food. They also have the coolest ice skating rink that is a maze instead of the traditional oval/rectangle! I couldn’t snap my camera quick enough when walking through the city! I wanted to capture everything - I was so giddy over the architecture and how the city was decorated for Christmas. JD definitely got annoyed with me a few times as my shutterbug “syndrome” was too much for him at times. HAHA! And, I hate to admit it, but he has a point that sometimes I need to enjoy the moment rather than focusing on capturing it…but, meh, what can you do. I just really love taking photos . I loved everything about this place. The bar has a cozy and chic lounge with colorful sophisticated velvet chairs and couches facing this incredible view of St. Stephan’s Cathedral. The cocktails are very creative (I had a drink with ice carved into a birds nest with “golden” raspberry eggs inside) and actually reasonably priced for the atmosphere given. 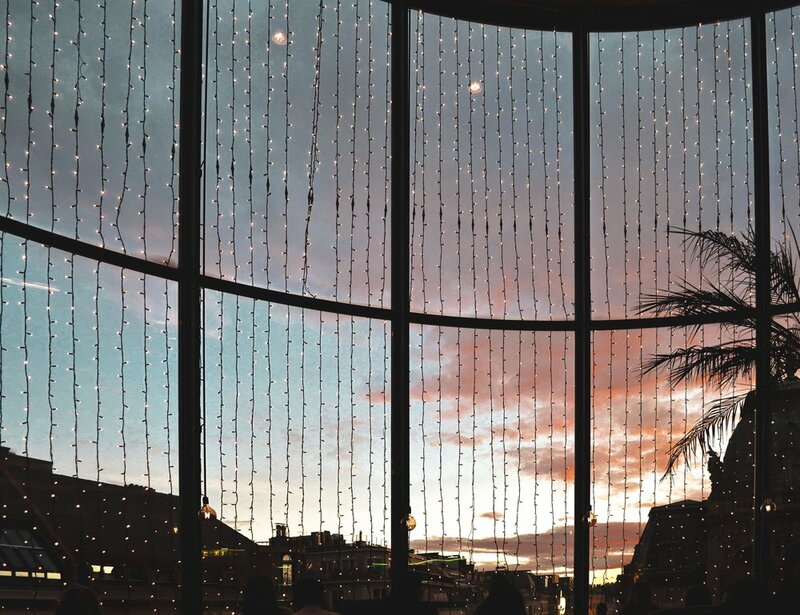 Perfect spot to watch the sunset and enjoy a few drinks! 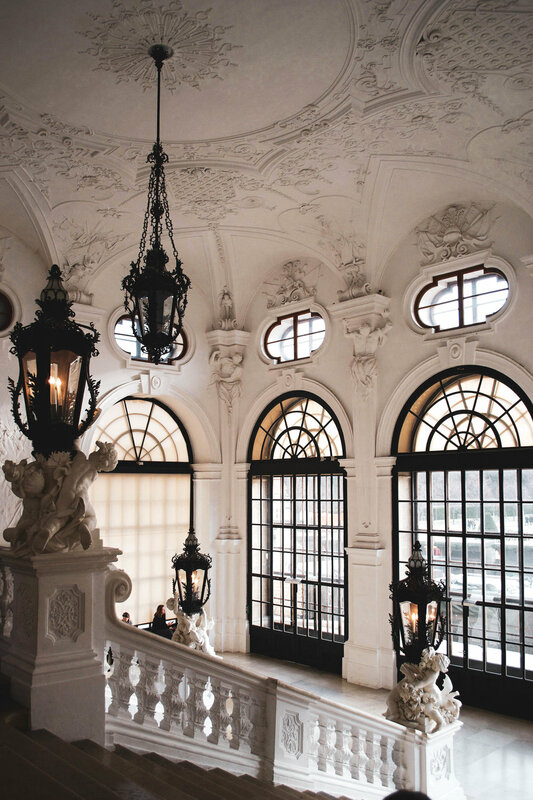 The word belvedere means beautiful view, which is what you see when looking out the Marble Room pictured above. The interiors and architecture is so heavenly throughout - it’s crazy to think this was just a “summer” residence for the Prince back in the day! I must say, it was really fun to get dressed up and listen to Vilvadi’s Four Seasons. Overall it was a really cool experience and something we have never done before. The church was so ornate and they even had the stage beautifully decorated with Christmas trees and candles. However, we unfortunately had a family in-front of us that kept whispering and moving throughout the concert, and due to the seating layout, it was challenging for us to see the stage from behind them. All of this was extremely distracting which was not only annoying but took away the enjoyment from the show. So, as mentioned earlier, I would recommend spending the extra money to sit as close to the stage as possible to avoid any distractions! If you ask American expats what food they miss the from the US, most of them will probably say Mexican food. JD came across this restaurant, Santos, and it is hands down the best Mexican food I have had in Europe, so far. Super authentic flavors, quality food, service and atmosphere! Highly recommend. Le Bol (pictured below) is a french cafe we stumbled upon to escape the freezing rain, and it was honestly the perfect spot to rejuvenate and get warm. I had one of the best coffees ever from there which was flavored with vanilla and cinnamon - super creamy, delicious and satisfying.